saucisson sec, originally uploaded by Seligmans Dog. I've let about 6 people sample this so far and no one has died. 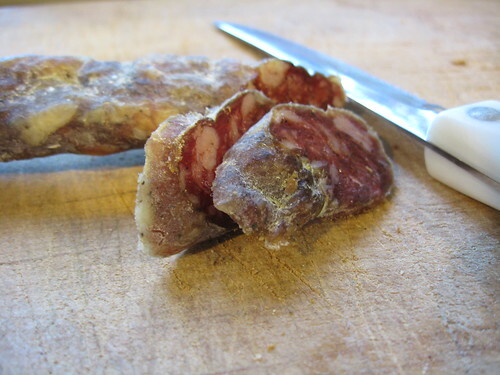 21 days after I hung it up to cure, the saucisson is now essentially done. It's furry, green, firm and very tasty. I took a few links and rubbed the exterior with a cloth and some cornmeal to remove the most of the exterior mold. I sliced it up thin to taste. The texture is tough, a little like jerky. It's been so long since we've been to France and I don't even remember what this should taste like. The wife says it's good - tad heavy on the garlic - but good. I followed Ruhlman's Charcuterie recipe but crushed the garlic instead of chopping it, I think that's why it's a bit strong. I've been giving out samples all over the place, so, before we go on any vacation this Summer, I'll be putting another batch up to cure. Yum. Xmas presents? ?